This Union Square apartment has certainly seen its fair share of scandal. 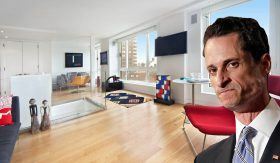 Notorious former Congressman Anthony Weiner, along with wife and Hillary Clinton aide Huma Abedin, moved into the duplex rental at Zeckendorf Towers in November 2014, just after his failed mayoral run and sexting scandal. And now that Abedin filed for divorce (nearly nine years since the couple announced their separation) after Weiner pled guilty to sending sexual text messages to a minor, they may finally be parting ways with the contemporary home. Three days ago, the Post reported that the unit hit the market for $11,900 a month, but the listing has since been pulled, perhaps from the publicity or because it was rented. New York may have the best restaurants in the world, but there is nothing like making a home cooked meal. We’re known for our tiny kitchens, but we’ve rounded up some great spaces that have all the amenities to inspire the master chef in anyone. 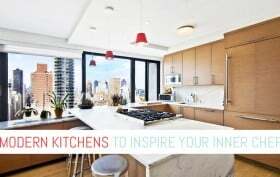 These sleek kitchens go above and beyond, giving ample space to cook up a feast for two or twenty. Whether uptown or downtown, in a classic prewar or new glassy tower, these modern kitchens will have you reaching for an apron.